It's only your big night once, so you'll want you and your hens to stand out when you hit the town. 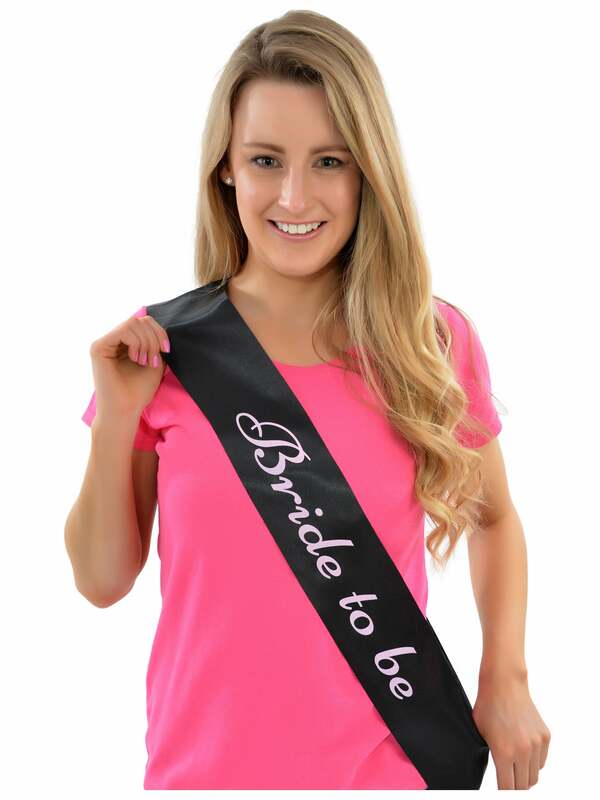 This Bride To Be Sash (Black With Pink Writing) is perfect for drawing attention to the group! The sash is black, with elegant pink writing that reads 'Bride to be'. Coordinate with your guests and get the matching Maid of Honour Sash, the Mother of the Bride Sash and the Hen Party Sash too! Showing our 3 Bride To Be Sash Black With Pink Writing reviews with an average rating of Excellent. Would you like to write a review? To say this product was in the value category, the sash exceeded expectations. It arrived folded up and packaged, I had read a previous review that theirs arrived creased and had to iron which wasn’t the case. These look great and the material isn’t cheap at all. Cheap quality material but i didnt mind as it did the job. I ordered 15x sashes for a hen, arrived 3 days later, all great. Slightly creased and id advise ironing them.